If you mention disco pants to anyone who grew up in the 1980s, the first image that will pop into their minds is Olivia Newton John in the hit movie Grease, specifically in that fantastic moment when she makes her transformation into ‘bad’ Sandy. In fact, it may have been this appearance which originally kicked off the craze for disco pants. As we all know, trends are recurring, which means that everything that was big in previous decades will eventually come back into fashion, if only for a short time. 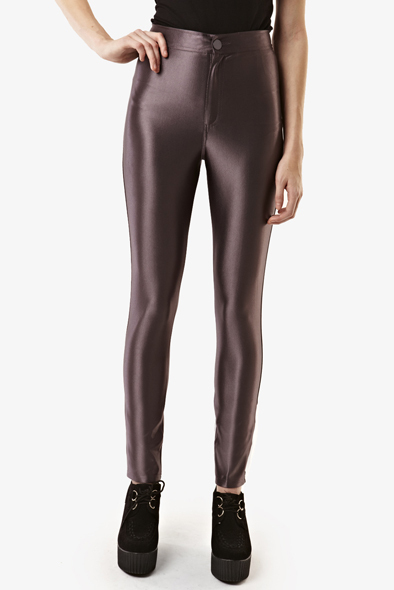 Disco pants are no exception, as after a long absence, they made a big splash last year in the Autumn/Winter 2012 catwalk shows. They remain popular into 2013, but are a trend that can be tricky to wear. The good news is that disco pants are very flattering for most body shapes. This may be surprising considering the tightness of the style and the sheen of the polyester material. In actual fact, as the material is opaque yet reflects the light, creating a shimmery line all down the front of the leg and around other curves, disco pants create a very slimming effect. Their tightness will also work in your favour, working in the same way as control underwear to pull you in and create a smooth silhouette. However, you do need to know what to team your disco pants with, as well as when to wear them. Follow these tips and you can’t go wrong. An easy-to-wear look for night-time if you don’t fancy wearing a dress is to show off your waist with a pair of disco pants and a tucked-in blouse or shirt. Disco pants tend to be high-waisted, but unlike other clothing for your bottom half, they hold in your tummy and flatter your bottom. By loosely tucking a printed or plain blouse into your disco pants, you can lengthen your legs and create a sleek, chic silhouette. A look that is perfect for daytime, and also great for those who are self-conscious about their hips or bottom, is to team disco pants with an oversized jumper. Choose a jumper that just skims the upper thighs and throw on a pair of ankle boots for a great casual look. Christine Felton is a Writer at Fashion Union provider of on trend women’s clothing in the UK.